One of the things that really struck me about my first 4e game was the amount of info the players and DM needed to track during combat. While every player is capable of recording their current conditions on their own character sheet, the colored condition markers we used made it easier for the whole party to see how the battle was going. I was quickly sold on the idea of marking conditions on the battlefield. Unfortunately, other than the fact that RED=BLOODIED, it wasn’t particularly intuitive to remember which colored token indicated which condition. Also, once you had two or three conditions stacked under a player or monster they had a tendency to topple over. 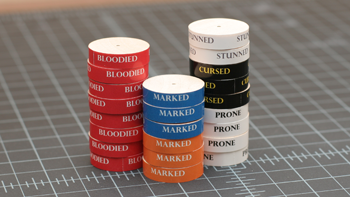 And so I set out to tweak the idea a bit – clearly marked condition tokens that stacked neatly. 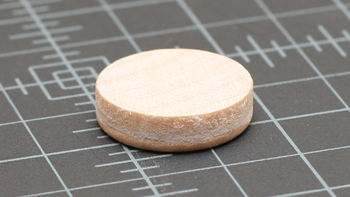 The general idea was to fashion 1” round tokens each 1/4” thick around the perimeter of which I could apply a label indicating the condition (e.g. “BLOODIED” or “PRONE”). I was hoping to make use of off-the-shelf craft supplies so as to minimize any actual fabrication time. 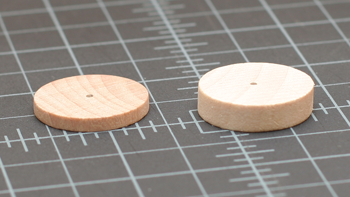 I found two types of 1” round wooden cutouts: a 1/8” solid disc and an 1/8” washer-style disc with a 3/8” hole in the middle. When combined I had a 1/4” thick disc with a centered, shallow hole into which I could embed a small rare earth magnet. Around the perimeter I would affix a narrow inkjet label. It was a solid attempt, but the washer-style cutouts were beveled and I ended up with a bumpy edge which did not make for a great surface for the labels. Trying to even out that bumpy edge turned out to be a bit of work, so I reworked my approach. For attempt #2 I chose a solid 1/4” disc. The edge was what I needed, but I needed to drill out a small whole for a tiny cylindrical magnet. Dremel at the ready, I d rilled a small hole in each disc and inserted a small cylinder-shaped magnet. I also made some 1/8” thick tokens for characters and monsters which will have pictures on top, but no labels on the edge. This worked fairly well, but the tricky part is making sure that the whole in each disc is perfectly centered so that they stack nearly. Truth be told, I never got the holes perfectly centered, so they don’t stack as well as I had hoped. If I were to make a third build attempt, I think I would try swapping the wooden cutouts for 1” interlocking poker chips. These would stack very neatly out of the box, but they are a good bit thinner, so you would need to pre-stack (and probably glue) a few of them together to bulk up to 1/4” thickness. I’d actually stack them slightly over 1/4” thick so that the condition label doesn’t ride the top and bottom edges (which I think makes them prone to peeling). You could use single chips either as bases for your minis or counters for characters and monsters. That way they would stack nicely on the condition tokens. OK… with tokens complete, I’m almost ready for the table. These turned out really well! The labels are a great idea. I wouldn’t worry about not getting the magnets placed *exactly* in the center, they look close enough when stacked. Our hand-stacked tokens never lined up properly either. And with the magnets, they’ll be more stable. The biggest problem we have with stacking the tokens is knocking over adjacent stacks on the battle map. These would seem to be a vast improvement!